The event was dedicated to the 75th anniversary of the rescue of the Bulgarian Jews during the World War II. 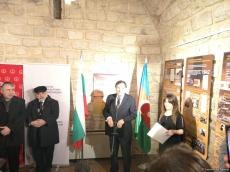 In his opening speech, Ambassador of Bulgaria to Azerbaijan Nikolay Yankov stressed that the rescue of 48,000 Bulgarian Jews in 1943 is an outstanding historical example that shows how personal and political courage, civic conscience and determination can resist the most devastating policy. The exhibition chronicles the resistance of the Bulgarian citizens, the brave refusal of society to obey the authorities’ plans to send Bulgarian Jews to Nazi concentration camps. The event was supported by the Embassy of Israel in Baku and Ambassador of Israel to Azerbaijan Dan Stav also made opening remarks at the presentation of the exhibition. “It is a great honor to say a few words on the opening of the exhibition “The Power of Civil Society: The Fate of the Jews in Bulgaria 1940-1944”,” Dan Stav said. “I am grateful to Ambassador Yankov for granting me the opportunity to share my thoughts you. The story of the salvation of the 50,000 strong Bulgarian Jews is unique and should be remembered for its merits as a great humanist approach of so many brave individuals. It should also serve as a constant reminder of the ability of leading individuals blessed with courage and conscience to form an active civil society that stands up firmly against gross injustice, despite facing hostile government that joined hands with Nazi Germany and very powerful fascist elements in Bulgaria,” Dan Stav noted. As many as 50,000 Bulgarian Jews were saved by the hard work of many members of the Bulgarian civil society, he noted. The exhibition has been shown more than 40 times on three continents since its premiere in 2008. It was realized in collaboration with the Centre for Jewish Studies at Sofia University St. Kliment Ohridski and State Institute for Culture at the Ministry of Foreign Affairs of Bulgaria. The exhibition will stay open for visitors from Nov. 30 to Dec. 1, 2018.